Hoppy’s Hope To End Huntington's Disease is a non-profit 501(C)(3) organization (EIN 27-0708797) founded for the purpose of raising awareness and funds to lend financial support to organizations dedicated to finding treatments and ultimately, a cure for HD. Huntington's Disease (HD) is a hereditary brain disorder, which slowly robs the effected individual of their ability to walk, talk and reason. Children of those affected by HD have a 50% chance of inheriting their parent's devastating disease. HD is known as a family disease because of its genetic nature and its dramatic impact on every family member. Hoppy bravely and graciously battled Huntington's Disease for six years. Sadly, Hoppy died at sunrise on Easter in April 2012. 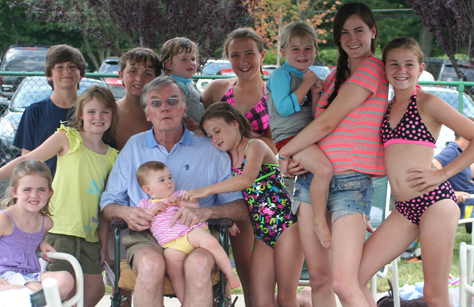 He is terribly missed by all who knew and loved him, especially his eleven beautiful grandchildren. In life, Hoppy appreciated every sunrise and his love for everyone in his life deepened with each setting sun. Hoppy's hope was that a cure for Huntington's Disease would be found very soon. Eleven little rays of hope still shine bright every day in hope for the cure that could have saved their Hoppy and hope it will be found in time for every family faced with HD. With your help, we can make this the last generation of Huntington's Disease.